The Glacier National Park Travel Guide is a resource for those planning to tour Glacier National Park and/or Canada's adjacent Waterton Lakes National Park. The adjacent national parks are typically visited at the same time and offer a variety of experiences. Both parks offer outstanding opportunities to view wildlife. 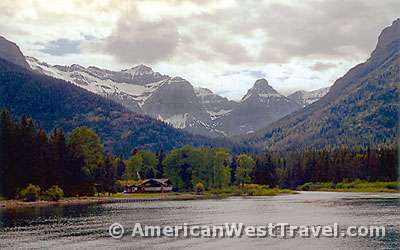 Glacier National Park is situated in northern Montana along the Continental Divide of the northern Rocky Mountains. Canada’s Waterton Lakes National Park in the province of Alberta borders along the northern edge of Glacier National Park. The two parks offer some of North America’s most spectacular mountain scenery and most beautiful lakes. In 1932, the United States and Canada agreed to join these two national parks as a symbol of their longtime peace and friendship. In recognition of this historic agreement, the parks were officially designated as the Waterton-Glacier International Peace Park, the first international park in the history of the world. The two countries do continue to administer the parks separately, and relevant information is provided in this guide. This guide provides a list of campgrounds for the parks and neighboring areas, a list of accommodations for the parks and neighboring areas, and a section for each of the major areas in the parks. Each section describes the area’s special features, points of interest, suggested hikes and/or scenic drives, recreational opportunities, and available services, including camping, lodging, and location of visitor centers. A blue Glacier National Park Travel Guide Menu is provided at the top of each page to allow you to navigate to each section. Both parks feature spectacular jagged mountain ranges, beautiful lakes, plentiful waterfalls, and are rich in wildlife. The leisurely tourist as well as the avid outdoor enthusiast can find plentiful recreation at Glacier National Park and Waterton Lakes. There are 700 miles of trails in Glacier; 200 miles in Waterton Lakes. Trails range from very short and easy to extremely challenging. Hikes can also be combined with guided boat cruises. You often can shorten a hike while getting great scenery on the lake. Numerous guided hikes are offered. There are even guided horseback rides for those who don’t like to walk. Bicycling is permitted on park roads with some restrictions. There are abundant scenic roads throughout the parks, including Glacier’s world-famous Going-to-the-Sun Road. Glacier National Park’s free shuttle bus service provides service along the Going-to-the-Sun Road and is much easier than driving! 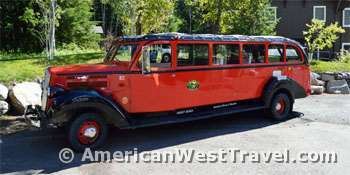 The park concessionaire, Xanterra, provides fee-based hiker’s shuttles between the St. Mary Visitor Center and Many Glacier Hotel/Swiftcurrent Motor Inn and Guided, Interpretive Red Bus Tours on “jammer” buses, vintage red motor coaches from a bygone era. Glacier Park, Inc. also provides fee-base shuttles between the hotels and various locations on the east side of Glacier National Park, including Glacier Park Lodge, St. Mary Lodge, Many Glacier Hotel, Swiftcurrent Motor Inn and the Prince of Wales Hotel. The Blackfeet Nation provides special bus tours in modern coaches, with the perspective of Native American culture. Guided rafting, fishing, and backpacking trips are offered by Glacier Guides & Montana Raft Company. Park rangers offer many guided hikes and other interpretive activities in all areas of the park. Pick up a current park brochure and newsletter at any visitor center or entrance station, or use the link below to access the park’s list of brochures and other publications. The parks are extremely popular with backpackers due to the spectacular and unspoiled nature of the backcountry. Both parks require permits for backcountry camping and generally require that you stay in designated backcountry campsites. The permits are available on a reservation system, and reservations are strongly recommended, especially for popular areas during July and August. Fees are charged for permits and reservations. See Glacier National Park Backpacking and Waterton Lakes National Park Backpacking. The parks are also noted for a number of classic chalet-style lodges built in and near the parks by the Great Northern Railroad to encourage tourism in the early part of the 20th century. Most are still open and providing stylish lodging to this day. See our Glacier National Park Lodging page for details. The railroad around the southern end of Glacier National Park is still active with stops (and lodges, now privately owned) at East Glacier Park, Essex, and West Glacier. Amtrak’s famous Empire Builder® provides service along the route. The park service offers many brochures and publications online (in Adobe PDF format) including the official park map, the current park brochure, current and recent newspapers, and backcountry camping information. Also, includes guides to various recreational activities and other topics of interest.